Opens the door for Ilias Chair if he goes so win, win. Yes but I think more probably Smyth would replace him in the current set up. It's not really Smyths best position though is it? I was thinking that, without Freeman, the attacking three would be Smyth, Eze, BOS. But Chair certainly looks like a Freeman type player. Tony's a bit miffed by the latest Freeman speculation. But, does anyone take any notice of him anymore? Have you considered marriage counselling? 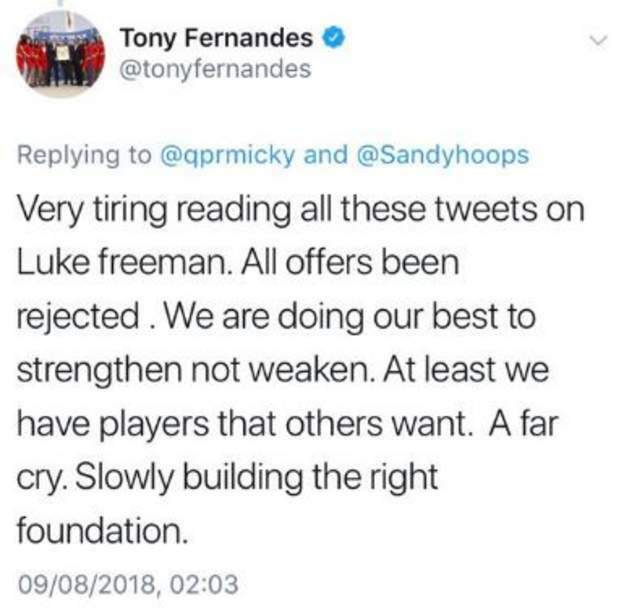 If it's tiring to have to tolerate one or two anxious tweets, Tony, think about how exhausting it is for the rest of us to follow QPR - the interminable sagas/red herrings/soap operas of the training ground/new stadium/FFP; selling our goalkeeper to the likes of Cardiff for a song; hiring and firing managers every five minutes while wittering on about the QPR 'family' etc. etc. Get a grip! ...so it looks like every player we are linked to....ends somewhere else....has it to do with the FFP thing...? We are not an attractive location at the moment...? Kayden Jackson to Ipswich Town for more than £1m. Plus we pay low wages and have a v low transfer budget. If you were a player Ipswich look a better bet than us. Please Elbow, why don't you get a grip? Smithies wanted to play in the Premier League, Cardiff were the only real offer that came in, QPR need money and we have cover in goal, so the deal happened. Do we all think that Alex is worth more, yes, but can we affect it? It could also be used to drive up the price if the clubs think we don't HAVE to sell a player, and we have other interested parties, which we do. I would bet that if that is the case, he won't get a scrap of credit for it. Too many so called fans just want to stick the knife in and don't care about what reason it is for. If true then that is 50% more than the original fee being touted which was already a 100% increase in value. That won't be a pleasant experience for the QPR bashers will it? I suppose they will have to resort to whining that he was our best player last year and we shouldn't have let him go blah, blah, blah. That's a blow if true but 4.5m is a bit more respectable. I guess we will have to get used to this as we have quite a few players who in a short while will look good prospects to predatory clubs. Thanks a lot FFP.